I’ve had adjustable dumbbells for the last 10 years. I started with the old school dumbbell rods that you could slide plates onto, and then fasten with nuts. I then moved on to a Powerblock 50-lb set for a few years. And then, I made the jump to the Bowflex 1090s. A significant reason for using these dumbbells was so that I could workout at home. I went through a phase where I was doing many home-workout video programs like P90X, X2, X3 and Body Beast. They all require access to dumbbells. An adjustable set was the perfect solution because it allowed me to have different weights for different exercises, all within one convenient and small footprint. 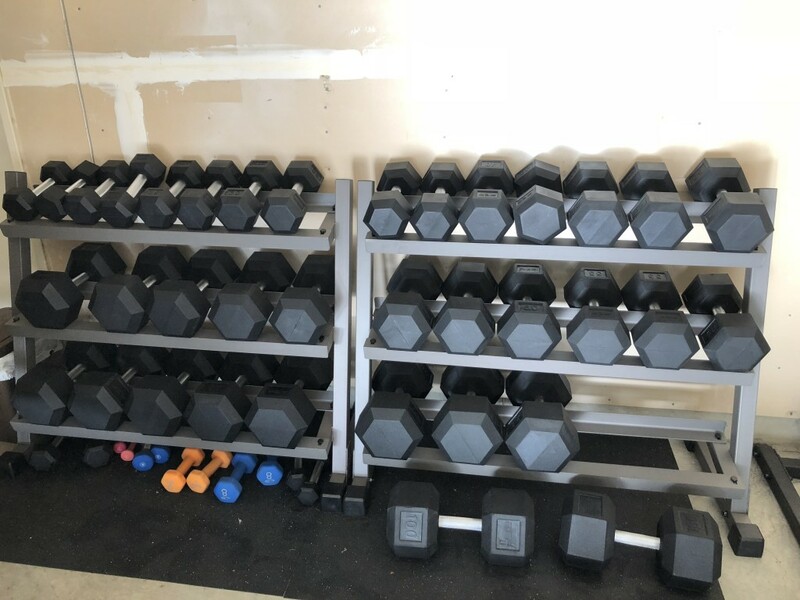 However, anyone who’s owned adjustable dumbbells knows that for all the convenience they offer from a storage and price perspective, they have some serious drawbacks too. For one, it becomes pretty annoying when you have to keep pausing your workout to adjust weights as you switch from one exercise to another. This gets even more frustrating when you’re doing supersets or drop sets. Another annoyance is that most of them have complicated and somewhat unwieldy designs. If you use a Powerblock set, you will notice that they have a slightly off-balance feel when you’re using them, given the way the plates are shaped, and the weighted rods in between the heads. And Bowflex dumbbells, especially the 1090s, are just incredibly long. Whether you’re doing 10lbs for rear delt raises or 90lbs for dumbbell chest presses, you’ve got this long weight in your hand that you have to balance and control while lifting. A third problem is the somewhat delicate construction of these dumbbells because you can’t just drop them on the floor after a set. I’ve made that mistake before, and it can cause severe damage to the dumbbell. I’m not against adjustable dumbbells, because I do think they are a fantastic option when you’re short on space and cash. But once I had the resources and space, I decided it was time to upgrade to a full dumbbell set and complete my garage gym. 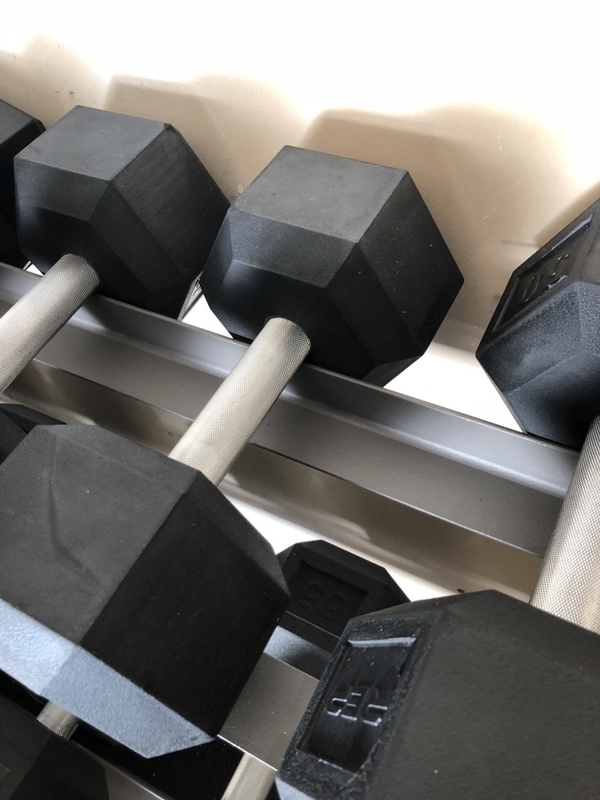 After scouring the internet for several months and doing a lot of research, I had narrowed down my choices to dumbbell sets from Rogue Fitness, Troy Barbell, Fringe Sport and Rep Fitness. Rogue’s set is significantly more expensive than the others, but I felt that a lot of that premium was simply for Rogue’s brand. What sealed the deal for me with Rep Fitness, was the package deal that I found on Amazon. I’m an Amazon Prime member and I have access to free 2-day free shipping. On Amazon, I found that Rep Fitness bundled their dumbbell set along with two high-quality x-mark racks, and a couple of rubber mats for added floor protection. All of this for a price that was still lower than Rogue’s set. To me, it seemed like a no-brainer. Sweet! It should come as no surprise that a full dumbbell set with pairs, from 5 lbs to 100 lbs, is heavy. 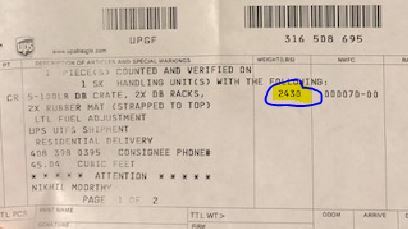 Throw in the storage racks, and my shipment weighed almost 2500 pounds. Delivery receipt. A complete dumbbell set from 5-100lb is 2,100 lbs! Plus pallet and packaging. A day after I placed my order, UPS called me and said they would need to schedule a delivery date and time. Understandable, because it’s not like they can just dump a metric ton of gym equipment on my doorstep like it was a bag of cat litter. I scheduled a delivery time, on a Friday. It was between 2 and 6 in the afternoon, so I had to leave work early to be at home when they arrived. However, it was only at 7 pm when I finally heard from them. It turns out, that because the package was so heavy, UPS loaded it into a 40-foot trailer. The problem was that this trailer couldn’t fit into the driveway of the gated community where I live. Fantastic news. So now what? The UPS guy told me I’d have to come to get it myself from the depot. Which is what I ended up doing. That’s right, I drove over to the depot, unboxed the dumbbells from their wooden crate, and loaded each packed dumbbell into my car. I had to make two trips to make sure I didn’t snap my car’s axle while driving back home. My shipping woes aside, I couldn’t help but marvel at the neat packaging. 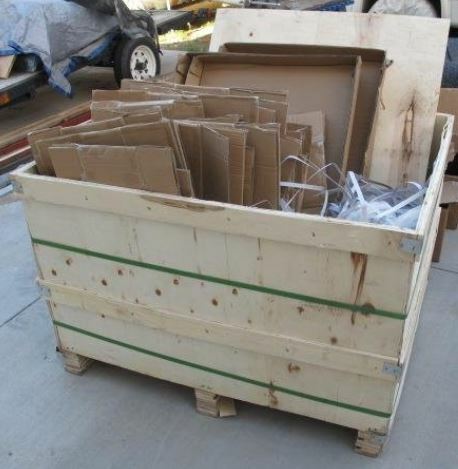 The entire 2500 pound set was neatly arranged to fit within a mid-sized wooden crate. And within that box, each dumbbell was neatly packed in a cardboard box, reinforced with nylon straps. This made the process of loading them into my car a lot smoother, and I was able to arrange them in an orderly fashion and distribute the load. The dumbbells between 5 lb and 50 lbs were packed in pairs, while the 55s onward were packed individually. The dumbbells themselves required no assembly, of course. The racks took me about 2 hours to set up, but only because I don’t have the best tools at home. I made do with an old-fashioned spanner and a pair of pliers, but I imagine it would have been far quicker if I had a socket-wrench. After putting the racks together, I proceeded to load the pairs onto the rack. The racks have the space to hold all 20 pairs of dumbbells, but there’s a design quirk that makes it a little difficult. I’ll elaborate in a bit. But once the rack was put together and most of the dumbbells were arranged, it came together quite nicely. While one could argue that hex dumbbells all look pretty much the same, I do feel that these dumbbells had a high-quality look to them. The rubber was clean, the finish was good, the metal handles, bright and shiny. I have seen no scratch marks on the rubber or irregular molding at the points of attachment between the heads and the handle. The heads are uniform, well-balanced, and precisely aligned. I can’t tell you the number of times I’ve worked out with hex dumbbell sets where one had felt a little wobbly or was a little bent compared to the other head. 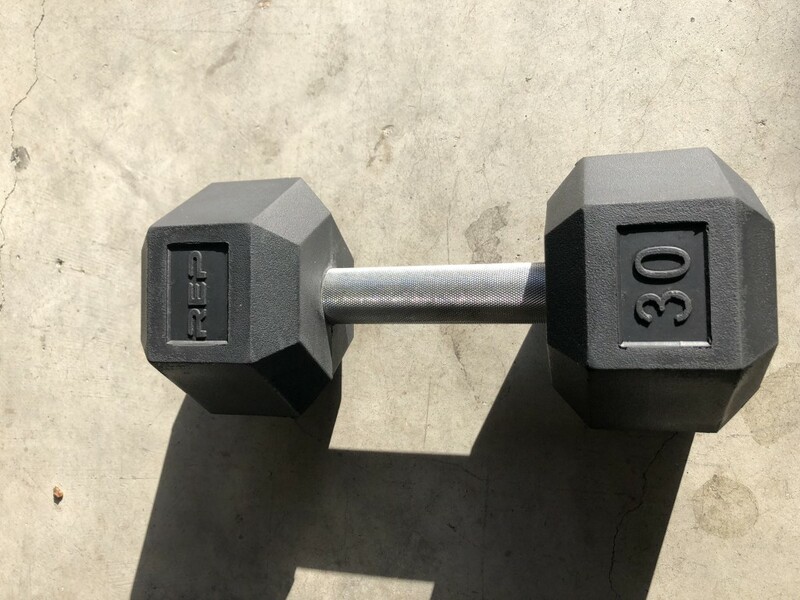 One unique thing about the Rep Fitness dumbbells is that they have a uniform handle. 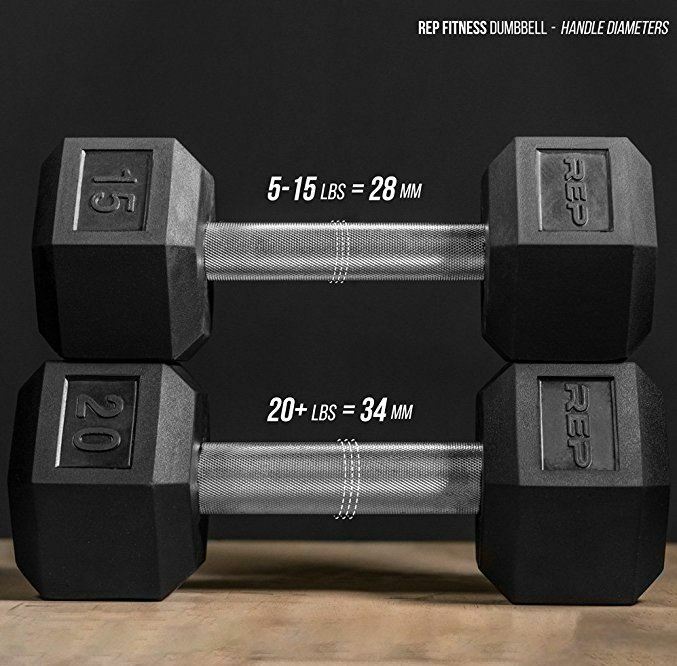 The dumbbells under 15 lbs have a 28mm diameter handle, while the 20s and heavier ones have a 34mm diameter. Most other hex dumbbells have a contoured handle, that is thickest in the middle and tapered towards the sides. I’ve never really thought about why that is, I always assumed it was meant to mimic the contours of the human palm. However, after using the uniform grip handles, I have to say the uniform handles feel way better. This design also allows me to hold the dumbbell at any point, either in the middle or close to the heads, for those times when my grip is failing (like heavy Kroc rows). The difference is even more noticeable when I compare it to the handles on the Bowflex (too tapered at the ends) and the Powerblocks (too thick). I’ve used hex dumbbells in gyms across the world and I’ve seen dumbbells ranging from very aggressive knurling to having almost none. 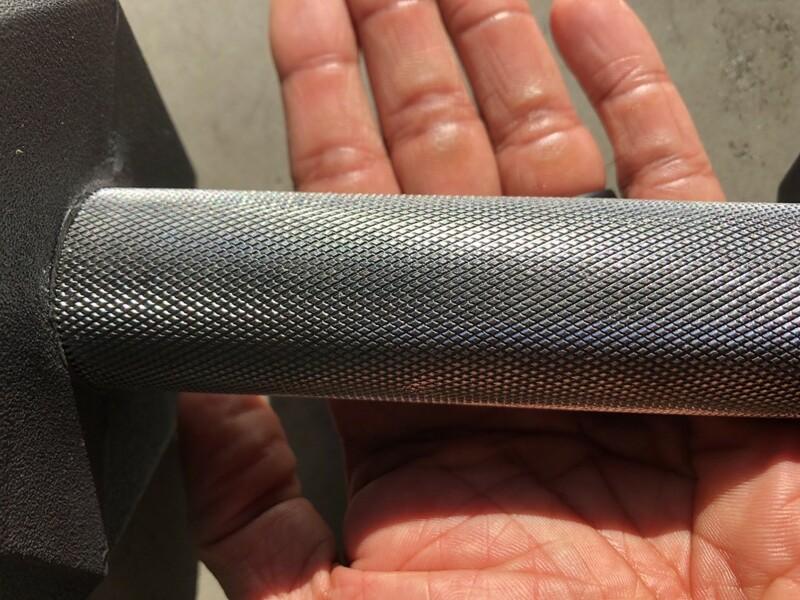 While I get why it’s possible to have different levels of knurling on a barbell, I feel that a good dumbbell ought to have a ‘Goldilocks’ knurl. Not too harsh, not too smooth, but just right. I’m pleasantly surprised with the knurls on these dumbbells. I haven’t had to use chalk or gloves, and they feel grippy enough without shredding my palm. I’d read tons of reviews online about other hex dumbbell sets that had a very strong rubber odor when they were unboxed. 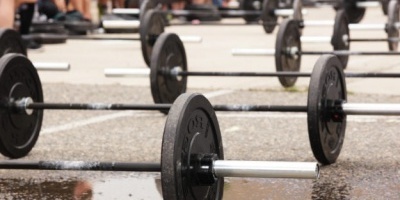 I’ve encountered the same odors when I first received my bumper plates. I’m relieved to report that these dumbbells, when unboxed, had almost no odor at all. After using these dumbbells for a few workouts, I’ve come to appreciate how very well constructed they feel in your hands. They feel compact, easy to grip and the transference of force just ‘feels’ better, especially when compared to my experience with adjustable sets. I have a couple of other X-Mark products and I’ve always been impressed with the quality of their construction. I use the X-Mark bench, which is a heavy-duty 1000-lb rated beast. So I was happy to see the same heavy-duty high quality finish with the racks. The racks were pretty easy to assemble, and they feel solid, like tanks. The welding and powder-coat finish are both very high quality. However, I do have one significant peeve with them. It’s the way they’re designed. The top part of each rack shelf has an upturned lip, with a gap in the middle, and a down-turned lip on the lower part. 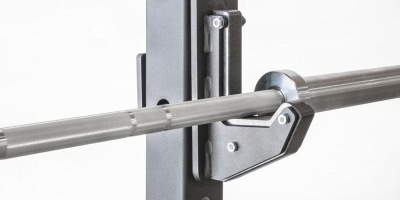 The upper lip is what holds the dumbbell in place, and the gap in the center is presumably there to allow a lifter’s fingers to pass under the handle as he lifts it off the rack. However, the gap is so large that the smaller dumbbells (5 lbs and 10 lbs) don’t sit on the rack, because they fall through the gap. And, given the fact that the only thing keeping the dumbbell in place is the upper lip against the upper head of the dumbbell, I feel that it poses a significant injury risk. It’s very easy to get your finger caught on that edge when re-racking a dumbbell, and if the dumbbell is heavy enough, I imagine you could break a finger. I suppose this was done to reduce the overall weight of the racks, making them cheaper to sell and easier to ship. But I’ve had to remind myself to be extra vigilant and careful when re-racking my dumbbells, just to make sure I don’t slice my finger off. Technically, there is enough space on the two racks to hold all 20 pairs of dumbbells. But I’ve deliberately kept the 100s down on the floor, because they’re just too unwieldy to try and re-rack, especially with the exposed upper lip. Overall, I have to say that I’m very pleased with Rep Fitness’s product. These are high-quality dumbbells, that are well designed and manufactured, and good enough for most home gyms. They wouldn’t look out of place at a small commercial gym either. If you have the budget, I do recommend buying a larger, safer storage rack. But if that’s not a concern, and the price as offered on Amazon works for you, pull the trigger. If you’re in the market for a full dumbbell set at a price point that won’t break the bank, look no further. You can get this 5-100lb set with racks and mats at Amazon or directly from Rep Fitness. Either way, Rep ships it from their facility in Denver. I totaled it up on Rep’s site, and with shipping it’s going to be very close to Amazon’s price with free shipping.